Alexa Bliss will return to action in the women’s Rumble match. She didn’t take the fall, but Ronda Rousey lost her first match in WWE. 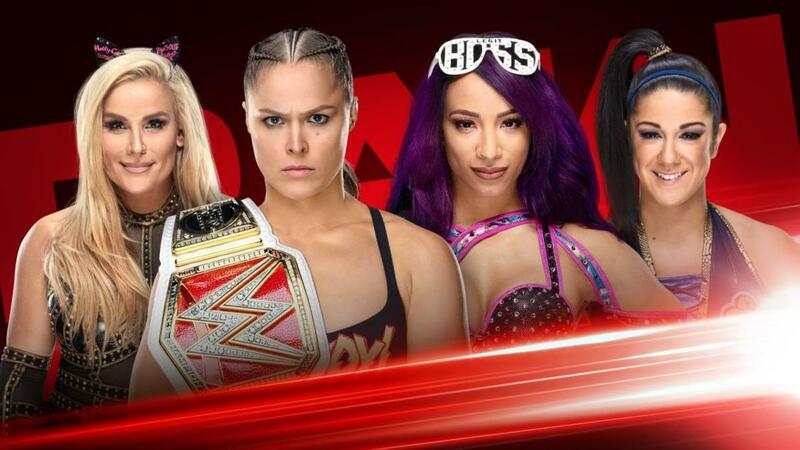 Sasha Banks and Bayley beat Rousey and Natalya after Banks made Natalya tap-out. Finn Bálor was allowed to shine over both Braun Strowman and Brock Lesnar, but was ultimately laid out with an F5 by Lesnar. They aired a Martin Luther King Jr. tribute video set to “When the Gates Swing Open” by Soul Stirrers. This was a more comprehensive video than they usually do and it received a standing ovation from the live crowd. Brock Lesnar and Paul Heyman came out to start the show. Lesnar was booed. Heyman brought up Finn Bálor, who was cheered. He tried to continue but upon mentioning Bálor’s name again, the crowd cheered again. Heyman said Bálor pinned John Cena, which was no fluke. Heyman called Cena the second greatest of all-time (intimating that Lesnar was first). Heyman recalled Cena saying he believed in Bálor and knows the fans feel the same. Heyman said he too believed in Bálor, who seized the moment, as he has his whole career. Heyman noted that Lesnar has been training to face Braun Strowman but has not trained to face Bálor, who is a completely different opponent. That’s why we believe Bálor can become Universal champion. Vince McMahon interrupted. He told the story of David and Goliath and suggested David was reincarnated into Finn Bálor. McMahon then turned on the crowd, calling Oklahoma City “hillbilly land” and said the fans must believe in fairy tales if they thought Bálor could win. Strowman interrupted. Strowman called last Monday the worst day of his life because Baron Corbin cost him $100,000 and his title match. He also said last Monday was the luckiest of Lesnar’s life, and if he was still champion after Sunday, Strowman would rip him apart like he did McMahon’s limo. Bálor interrupted. Bálor said, “same old Monday Night Raw.” Bálor said he beat three others last week, including Cena, and earned his opportunity. Bálor knows McMahon doesn’t believe in him, but the Bálor Club does. Bálor said he would reclaim his Universal title. Strowman didn’t think Bálor could win. Bálor thanked Strowman for the support, then told him he would do something Strowman has never done and that’s beat Lesnar. I guess Lesnar got bored because he and Heyman abruptly left the ring. Bálor reminded McMahon that the people didn’t know what David was made of and it was Goliath who fell. Bálor turned to Lesnar and said no one was laughing at David after that. McMahon invited Lesnar to remain at ringside and booked Bálor vs. Strowman up next. Bálor was right, this was the same old Raw. It was almost 25 minutes after the hour by the time this was all done. Early in the match, Strowman ran over Bálor with a shoulder tackle on the outside. Later, he tried it again, but Bálor caught him with a slingblade. Bálor used a sleeper hold to slow down Strowman, then hit a double foot stomp. Bálor went to the top but Strowman pushed him to the outside and he was caught by Lesnar, who gave Bálor an overhead belly-to-belly, which was somehow not a DQ. The referee checked on Bálor as Lesnar leaped on the apron. Bálor yanked him off the apron and dropkicked him into the post. Bálor then wiped him out with a flip dive. Bálor gave Strowman a slingblade, then knocked Lesnar off the apron again and dropkicked him into the barricade. Strowman tossed Bálor back in the ring, but ran shoulder first into the post. Bálor dropkicked him into the corner and nailed Coup de Grace. Before he could go for a cover, Lesnar popped in the ring and gave Bálor an F5 for the DQ. Lesnar sold like crazy for Bálor. Lio Rush said Lashley was better than Dean Ambrose, Seth Rollins and everyone in the locker room. They weren’t out there to issue an open challenge, because open challenges were for kids. Rush said they were in this for the money. Lashley stood on a podium and posed for the crowd. Apollo Crews interrupted. Crews said Lashley was an impressive athlete but nobody paid their money to see him pose, they want to see him fight. Crews knew he wouldn’t accept a title match, but challenged him to a fight. Rush said Crews would get the match if he could beat Lashley in a pose-off. Crews chuckled and said he didn’t know how to pose. Rush said he doesn’t know how to be a champion either, based on his track record. They traded poses. Crews won over the crowd by doing wacky little moves before mimicking Lashley’s poses. Lashley attacked Crews, but Crews sent him out of the ring, then press slammed Rush onto him. This segment was ok. At least the crowd got into Crews a bit. This didn’t last long. Crews seemed to be winning but got distracted by Rush on the apron. Crews yanked him into the ring and was about to press slam him, but Lashley nailed Crews with a spear for the win. Second straight match that could’ve ended (earlier) with a DQ. As Lashley celebrated, Seth Rollins entered for his match and they stared down on the ramp. During the match, Renee Young said, “this is definitely the season of gaining as much momentum as possible.” I don’t blame her for the bad line since this easily could’ve come from any of the announcers. Seth Rollins said we were celebrating Martin Luther King Jr. and we can especially learn from him today. He quoted MLK (“The ultimate measure of a man is not where he stands in moments of comfort and convenience, but where he stands at times of challenge and controversy”) and tried to compare it to his own life’s problems. He also tried to claim that he wasn’t the stereotypical WWE superstar because he wasn’t as big as Drew McIntyre and wasn’t as powerful as Bobby Lashley. He called himself a small town guy and sucked up to the live crowd. He said he could be working in a factory or driving a truck, but he was here because he had heart. He fired up, called himself “the man” and said he would win the Rumble and main event WrestleMania. McIntyre interrupted. McIntyre said Rollins wouldn’t win the Rumble because of his style. His flying around would lead to him getting eliminated. McIntyre hoped that he and Rollins were the last two men in the ring, because he wanted to eliminate Rollins so he could hear them announce McIntyre as the winner of the Rumble and the man who will win the Universal title at WrestleMania. Rollins’ promo was very lame. Also, for the third straight time on the show, a talking segment led to somebody interrupting which led to a match. Rollins used a suicide dive early. He tried a dive off the post to the outside, but McIntyre moved and Rollins crashed into the barricade. McIntyre dominated from there and hit a reverse Alabama Slam on the outside. After a break, McIntyre tried a side slam but Rollins floated through and hit a falcon arrow. McIntyre avoided a charge but Rollins caught him with a superkick for two. The crowd chanted “this is awesome” as the two men exchanged strikes. Rollins was getting the better of it until McIntyre nailed him with a headbutt. McIntyre followed with a White Noise off the middle rope for a nearfall. As soon as Rollins kicked out, McIntyre picked him up and hit a sit-out powerbomb for another nearfall. That was cool. Suddenly, Rollins countered into a schoolboy for the pinfall win. Fun match and the crowd was into Rollins. Backstage, the Revival complained to Vince McMahon. About getting screwed in their title match, that is. McMahon asked what they wanted. Revival asked for one more title shot, but with a guest referee who would call it down the middle. Curt Hawkins showed up but before he could ask for anything, McMahon said he wasn’t interested in giving him any matches because he’s lost too many. Hawkins just wanted an opportunity. McMahon made him the referee for the Revival's match. Revival initially didn’t seem thrilled but then sucked up to Hawkins. Ambrose was backstage and said Rollins using an MLK quote was cute. He had an MLK quote of his own: “Injustice anywhere is a threat to justice everywhere.” Ambrose called it a glaring injustice that he was not IC champion. He warned Rollins and “bend-over Bobby” that he would go after them in the Rumble and toss them both over the top rope. Ambrose said 2018 was not his year. He spent the better of it in a hospital and literally drove his body into the ground, to no gratitude. He said the Rumble would be his shining moment, his miracle on ice. This Sunday, justice would be served. Ambrose was good here. Gran Metalik won with a backbreaker, which might’ve been a botch. Sunil Singh seemed to kick out after the three count and Samir appeared to be on his way in to break up the cover. The announcers were caught off guard. After an EC3 video package, he was shown posing in front of a mirror. Dana Brooke asked him about his pre-match routine, then Elias walked by them. EC3 never said a word. Elias was in the ring. Before he could perform, Corbin interrupted. He got a lot of heat again. Elias told a production guy to cut Corbin’s mic, so he did. Elias performed a song. Elias wondered why Corbin still wore his vest and led the crowd in a “you got fired” chant. You’ll never guess what happened next. Corbin won clean with End of Days. They tried to claim Corbin got in a cheap shot before his finisher, but it wasn’t really. I forgot to mention it earlier, but Cole said Cena’s status for the Rumble was questionable after suffering an ankle injury at the hands of McIntyre last week. Bliss plugged the Rumble matches and listed every single name announced for the women’s Rumble (with a graphic showing all of those women on the screen). Bliss introduced one of the favourites, Nia Jax. Bliss asked who she would face at Mania if she won. Before she could answer, Ember Moon interrupted. Bliss said she wasn’t invited. Moon said she was tired of waiting for an invitation and said she would win the Rumble. Alicia Fox came out, said she was the captain of the division, and would win the Rumble. Mickie James was next. She said she has stolen the show at Mania before and would do it again. They bickered for a bit until the Riott Squad, Tamina, Dana Brooke and Nikki Cross came out. Bliss stood on top of her chair and told them to stop being catty. She told them all to calm down, so Jax pushed someone and the group got into a brawl (everyone except Bliss), which spilled to the back. They cut back to Bliss who delivered a couple of lines to silence from the crowd. Bliss then announced she would be competing in the Rumble match, which got a pretty big pop. Lacey Evans came out next. Evans called them all nasty, classless, little girls. Evans said the Rumble winner would not be a “sawed-off, girly, little runt.” Evans said she would win. This really sucked. There was a pre-taped segment where Titus O'Neil announced he would enter the Rumble. A stagehand appeared randomly and O’Neil was annoyed. That was the segment. Heavy Machinery won quickly with The Compactor. Just before that, Otis Dozovic did the worm into an elbow drop, which the crowd enjoyed. Weird introduction aside, I can see this act getting over if they do this every week. Early on, Gable tagged Roode but Hawkins didn’t allow it because Roode wasn’t holding the tag rope. Revival then double-teamed them, but Roode and Gable fought back and each hit t-bone suplexes. Roode launched Gable over the top on to Dash Wilder, but Scott Dawson took Gable out with a clothesline. After a break, Gable tagged in Roode who gave Wilder clotheslines and a back body drop, then gave Dawson a Uranage. He clotheslined Dawson to the outside, then gave Wilder a spinebuster. Wilder floated into a cover on Roode as Dawson held Roode’s leg down, but Hawkins saw and stopped the count. Wilder then tried a cover with his feet on the rope, but again Hawkins saw it. Gable tagged in and Dawson caught him in a roll-up, but Hawkins stopped the cover again, this time because he had the tights. The Revival tried yet another assisted cover, but Hawkins broke it up, which allowed Gable to roll through into a roll-up for the pinfall win. Roode and Gable retain. Afterwards, Hawkins explained his actions to the Revival. Before he could leave, they attacked him. Zack Ryder ran out to save his old partner and helped him to his feet. Ronda Rousey told Dasha Fuentes that she’s been thinking if she owed Sasha banks an apology but realized she didn’t owe her anything. The crowd cheered. Rousey said she gave Banks a title shot but Banks wasted no time in insulting her. Rousey ranted about Banks and finished by saying Banks would have to answer to her, the boss’ boss, the “H.B.I.C.” and the Raw Women’s champion. Rousey had good presence, but she also flubbed a couple of her lines as she spoke a million miles an hour. Before the match, Natalya had to hold back Rousey from attacking Banks. Banks cut a promo asking Rousey who she thought she was. Banks said she was a four-time champion, was in the first women’s Hell in a Cell match, and lasted 54 minutes in last year’s Rumble, while Rousey walked in and was handed everything. Banks said she made Jax tap out and she would do the same to Rousey. They wanted to attack each other but were held back by their partners and the referee. Corey Graves said Banks was reading too many Reddit forums by people who claimed she was the best thing since sliced bread. The match started with Banks and Natalya, but Banks immediately knocked Rousey off the apron. Banks and Bayley double-teamed Natalya, so Rousey knocked them both down with judo throws. After a break, Natalya tagged in Rousey and they gave Bayley a Hart Attack. Banks and Bayley double-teamed Natalya again to take over, but Natalya eventually got to the corner so Rousey could tag in. Rousey got Banks up for a Samoan drop, but Banks countered and applied the crossface until Natalya broke it up. Bayley tagged in but Rousey fought her off, hitting knees and a kick to the midsection. Rousey tried for the armbar on Banks but Banks rolled to the ropes. Rousey tagged in Natalya and the referee could be heard telling them they had two minutes left. Natalya ran wild briefly but Banks caught her in the crossface for the submission win. Afterwards, Rousey and Banks got in each others’ faces and were once again held back as the show ended. This was a clunky match, to say the least. On the plus side, Rousey and Banks were pretty convincing as rivals. She didn’t take the fall, but that was Rousey's first loss of any kind on WWE TV.